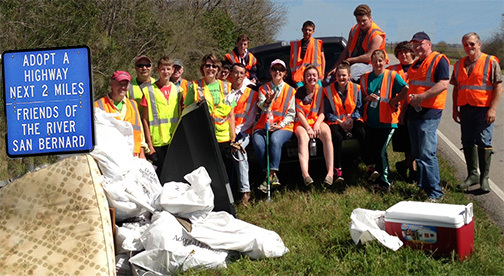 A TV, a mattress, two satellite dishes, and 38 bags of trash were collected along a mile either side of the Churchill Bridge on FM 2611, by twenty volunteers of Friends of the River San Bernard, Saturday, March 5th. The volunteers were (not in this order in the photo) Mike Pudlo and Tom Ronayne - Adopt A Highway Chairmen, Barbara Pudlo, Christian Steinmetz, Traci Cornett, Lynette Nagler, Patrick Nagler, Cole Nagler, Mandie Thornton, Payton Herrington, Ken Wright, Wayne Head, Grant Parker, Wes Parker, Wyatt Fischer, Cody Garrison, Steve Williamson, Mike Goodson, Suzanne Goodson and Randy Miller. Constable Fred Kanter provided the highway patrol car alerting traffic of the trash collection. Your participation sends a clear message that your efforts really do make a big difference. Take pride in the fact that you were part of making the area around the San Bernard beautiful. Thanks for participating!! !